One of the main attractions of Spinzilla is that it has been specifically developed with mobile play in mind. 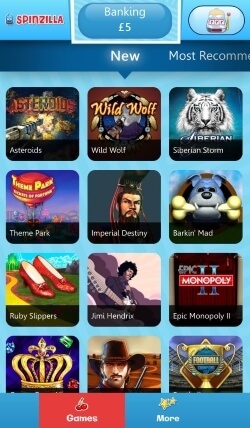 You can still play on a desktop PC, however, you can get their full range of casino games at the Spinzilla Mobile Casino and if you are an IOS mobile user then with their dedicated Spinzilla Mobile App. You also get the same great casino rewards and casino bonuses including a 100 free spins welcome offer. Spinzilla is operated by Cassava Enterprises (Gibraltar) Limited, which is licensed to offer online gaming services by the Government of Gibraltar. For UK players, the casino is also operated and managed by 888 UK Limited and is licensed and regulated by the United Kingdom Gambling Commission. To get the Spinzilla Mobile App for your IOS device, just visit the app store and search for Spinzilla. Once you have found the app, just download and install it on your mobile device in the standard way. Once the Spinzilla Mobile App is installed on your mobile device and you open it for the first time you will be asked if you would like it to send you notifications. Following this message, you will arrive at a login screen. Unfortunately, with this app, you are not able to view any games until you are a member. Therefore you need to either register as a new player or log in to an existing account. Opening an account is very simple and once you have followed the straightforward registration process you will be able to access all sections of the Spinzilla Mobile App. You will also have £5 in your account as a free bonus if you are a new player. The main home screen of the app is quite simplistic in nature. It is predominately blue with grid-like images of the games laid out across the screen of your mobile device. The very top bar of the app includes the Spinzilla logo, access to your banking information including your current balance and the facility to deposit and withdraw. Then on the far top right you have details of any special offers you have received. 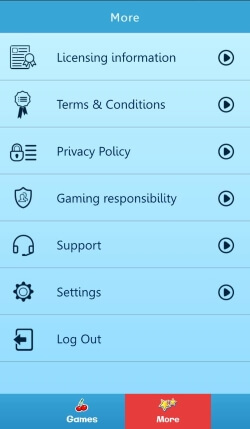 Underneath these, you will find a sliding menu option to choose game categories. These include New, Most Recommended, Progressive Jackpot, All Slots, Scratch Cards, Table Games and Seasonal Special. Selecting any of these categories will then filter the display of games underneath to reflect your choice. At the very bottom of the app, you have two main options. These are shown as ‘Games’ or ‘More’. The games option simply brings you back to the main home screen for all games. The more button gives you access to legal information relating to Spinzilla along with app settings and customer support. Once you have found a game that you wish to play you just tap the image of the game and it will quickly load up that game for you. If you are a new player you can immediately start to play using your free casino bonus. However, if you have used this bonus or are an existing player at Spinzilla, then you will need to fund your account before you can play. There is no Freeplay mode with the Spinzilla Mobile App. In summary, the Spinzilla Mobile App is a good addition to the apps on your mobile device if you enjoy playing online casino games. The app is quick to load and responsive to use. 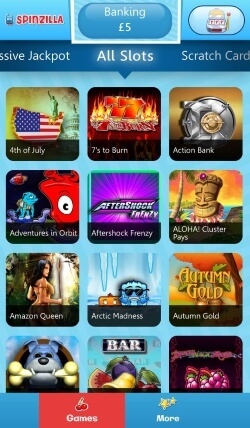 It may not be the fanciest looking app but it provides a great choice of mobile casino games. The only downside is that unlike the Spinzilla Mobile Casino website, the app is limited regarding table games and doesn’t include their live casino games. The Spinzilla Mobile App is compatible with iPhone, iPad and iPod touch with iOS version 6.0 (or higher).